In his vivid and thought-provoking filmmaking debut, physician Ryan McGarry gives us unprecedented access to America's busiest Emergency Department. Amidst real life-and-death situations, McGarry follows a dedicated team of charismatic, young doctors-in-training as they wrestle openly with both their ideals and with the realities of saving lives in a complex and overburdened system. Their training ground and source of inspiration is "C-Booth," Los Angeles County Hospital's legendary trauma bay, the birthplace of Emergency Medicine, where "more people have died and more people have been saved than in any other square footage in the United States." CODE BLACK offers a tense, doctor's-eye view, right into the heart of the healthcare debate - bringing us face to face with America's only 24/7 safety net. "Code Black chronicles the challenges of providing care in one of the nation's busiest emergency departments. It deftly captures the adrenaline of resuscitating critically ill patients and explores the role of the emergency department as the healthcare safety net." 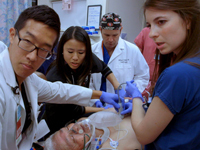 "Electrifying is one way of describing Code Black, a remarkably candid and kinetic documentary about emergency medicine that could probably only have been made by an ER doctor." "A remarkably intimate portrait of a small group of young doctors swimming upstream against a nearly overwhelming tide of challenges. Viewers are treated to unfiltered glimpses of the expertise, emotion and chaos of emergency medicine and must discover an overarching message in the film themselves from its extensive and at times unrelenting glimpses of largely uncompensated patient care. One message is clear, however. Healthcare is broken. This film will be excellent for teaching purposes: for use in curricula in management, health care management, medicine, social work, and more." "Dramatic...Code Black is an effective and well-done presentation of the trials and tribulations of an ER and all who serve within its walls." "Insightful...Obamacare or not, something has to be done about America's inefficient and unjust healthcare system, and young idealistic doctors are the best-placed and best-informed to suggest what those changes might be...Suitable for high school classes and college courses in cultural anthropology, medical anthropology, and American studies, as well as for general audiences." "Code Black is highly recommended for every academic library that supports health sciences programs, particularly medical and nursing schools. It should probably be required viewing for anyone thinking about going into emergency medicine." "What comes across loud and clear is the incredible idealism of doctors who are struggling to be effective in a healthcare system hobbled by political and economic constraints...insightful and genuinely moving...Highly recommended." "What makes the film so powerful is its insider's perspective. Viewers are privy to scenes they could not possibly witness elsewhere...A highly ambitious and spellbinding film...Vitally important, urgent and sometimes heartbreaking, Code Black is consistently absorbing." "Code Black provides a compelling insider's view of what it is like to be a doctor in training in our struggling safety-net health care system. The documentary follows the transition of one of the nation's first emergency departments to a state-of-the art facility that comes with stifling paperwork requirements. The efforts of compassionate young doctors who outsmart the system should be inspiration for us to look critically at how health care is delivered in the United States, and to explore creative solutions." "Code Black provides a unique window into the struggles of some of our country's biggest unsung heroes. These passionate young doctors are trying to make an increasingly challenging health care system more humane for the patients they serve. As an emergency physician myself, living with many of the similar challenges day to day, I was inspired by the ideals of the next generation of physicians." "A vigorous companion piece to Peter Nicks's revealing 2012 documentary, The Waiting Room, Code Black (the title describes the emergency room's saturation point) is a keening cri de coeur. Warriors for the neediest among us - the unauthorized, uninsured and just plain unlucky - Dr. McGarry and his cohort save plenty of lives. What they're most in danger of losing is hope." "Provides a fascinating and dramatic look into the ER. It also sheds light on health care reform as seen by those in the trenches." "Excellent...Shows what is really at stake as we debate how to make our system better, stronger and more equitable. Code Black shows the hospital emergency department as the great equalizer, where the minimum wage worker meets the corporate executive facing the life and death circumstances of a traumatic accident or illness, and the health professionals who work to keep them alive. In spite of its complexity, we are all part of a single health care system tied together by the dedication of those who spend their time and intellect to keep us alive and ready for another day." "Riveting! McGarry has created something that feels personal, vital and revelatory." "Code Black is a provocative, realistic depiction of a group of dedicated physicians providing care on the front lines of one of the busiest emergency rooms in the country...This film is a unique education in the art of healing broken lives, with valuable lessons in compassion, perseverance, and true grit within the increasingly complex world of healthcare delivery." Scene selection and subtitles for the deaf and hard-of-hearing. "A must-see for anyone concerned about the state of health care in this country. Which should be all of us...Code Black is sobering stuff. The American health system, McGarry's film argues, is broken. But the film is undeniably inspiring, too: Despite everything that is wrong, there are nurses and doctors and technicians determined to do things right." "Code Black will be of particular interest to those contemplating a career in medicine, because the young physicians spend a fair amount of time discussing their motivations for choosing medicine, and emergency medicine in particular, as their career. In addition, Code Black offers what seems to be a fairly realistic view of what working in a big-city, public hospital ER is really like." "Code Black feels like a brisk, vital report from the frontlines of emergency medicine, forged and rooted in the most intense sort of personal and professional experience." "Provides an incredibly intense, and genuinely moving, glimpse into the operation of one of the nation's premier emergency medical facilities." "One of the best documentaries I have ever seen, a jaw dropping look inside the birthplace of the modern Emergency Room...Code Black provides and honest portrayal of an ER while tackling some major issues with the health care system without trying to have an agenda or be preachy. It's a remarkable look inside a broken system." "You've probably heard or read about most of the problems presented in Code Black, a compelling documentary about the struggles of an overburdened emergency room. But reading about such problems is one thing - seeing them up close is quite another."